Former Botswana President Ian Khama (file photo). The race for the presidency of the Botswana Democratic Party (BDP) has heated up with the New Jerusalem faction having already started country wide campaign tours as infighting in the ruling party throws the country into political disarray. The race will pit the incumbent President Mokgweetsi Masisi and former cabinet minister and Member of Parliament for Serowe South Pelonomi Venson-Moitoi. The NJ, which has the backing of former President Ian Khama, started their campaign to dislodge power from his predecessor Masisi on December 23, 2018 in Palamaokue (Khama's official residence) in Serowe. At that meeting, the faction came up with a campaigning strategy and candidates for other positions for the Central committee. 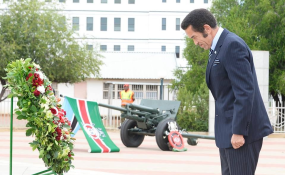 Former President Khama informed the meeting that he will be leaving for London on January 16 to go and meet some of his conservation friends who will assist in fundraising for the campaign. "Immediately when he comes back from the international trip, Khama announced that he will join the campaign by addressing regions in his capacity as former party president," revealed a highly placed source. One of the areas that President Khama will visit is Nata/Gweta where area MP Paulson Majaga has previously complained that Khama never visited his constituency during his reign - even during the floods. "We know the area is flood prone and we have everything in place and immediately floods hit the area, Khama will be the first to be there with all the aid," revealed the source. Khama is expected to lead campaign in the regions that are difficult to penetrate by other faction leaders like the three North West Constituencies of Maun West, East and Ngami respectively. This is made easier by the fact that, just like Masisi, Khama has access to presidential and Government aircraft to use for his travels. This means that he will lead the charge in countering Masisi across all regions and timeously. NJ leaders Venson-Moitoi, Samson Moyo Guma and Roseline Panzirah Matshome have launched a strong campaign bid across the country and those close to their operation claim that they are scoring some measures of success. The faction claims to be very close to securing 10 regions which will see Venson-Moitoi winning the presidential race at the special congress. One of the reasons that the NJ vigorously started campaigning early is to ensure that they block a proposal to have the Elective Congress postponed. The Women and Youth Wings of the party have in December called for the postponement of the elective congress as it threatened to split the party. The final decision will be taken at the National Council by the delegates and NJ wants to ensure that the decision of both the Central committee and the two wings be defeated. One of the issues that the faction raised at Serowe meeting was the need to have more media contacts that can help in spreading the message and discredit the Masisi faction. "We have some journalists in our system but we need more and if there is need to pay them to do the articles we are ready to do that," revealed the source. At the closed meeting it was revealed that the security for the faction leaders has been secured and that there is spying equipment for their use. "One of the cabinet ministers who is aligned to our faction wanted to resign in order to concentrate on the campaign but was advised to stay put and work as our spy inside government," revealed the source. The spy unit is in the outskirts of Gaborone and works closely with some agents who are aligned to the previous administration. The spying equipment is allegedly from the Swedish telecom firms Ericsson and TeliaSonera. The camp is said to have equipped itself with Druid DS-600 to protect itself against any kind of wiretapping, revealed a source. Chairman - Tshekedi Khama who is expected to square off with incumbent Vice President Slumber Tsogwane. Secretary General- Samson Moyo Guma - expected to square off with incumbent Mpho Balopi. The two used to be business partners and political buddies. In 2013 they team up together during the Maun Congress in which Guma beat Venson Moitoi for the party chairmanship. Treasurer - The team has agreed to approach one leading local business man to contest the position. Deputy Treasurer - They have identified a local businessman to take on the incumbent Jagdish Shah. Deputy Secretary General - former Balopi and President Masisi's ally Roseline Panzirah Matshome will contest the DSG position and is not yet clear if the incumbent Shaw kgathi will contest again. The campaign will be led by one of the BDP's long serving councilors in Serowe Lesego Raditanka. Raditanka was one of the campaign managers for Moyo Guma during the 2013 Maun Elective Congress. He will be assisted by Specially Elected councilor in Gaborone and former President Khama's cousin Foster Seretse.